Last Chance to Bid on an Original Stefan Bucher Monster! Good morning! Today is the last chance to bid on an exclusive Stefan Bucher monster illustration created for 36 Point. All proceeds (yep, 100%) will be donated directly to The American Red Cross when the bidding ends later this afternoon. Currently the monster is going for a steal on eBay, so if you like you some original art, be sure to at least check out the auction page! You can see the creation of this monster here. And while you’re at it, don’t forget to visit DailyMonster.com or pick up Stefan’s book on Amazon. We’ll be back later today with the results! The illustration created by Stefan in this video will be available for auction Wednesday, March 12. Proceeds will benefit the American Red Cross. Click here for more information. Stefan Bucher Daily Monster Charity Auction Now Live! The charity auction benefitting the American Red Cross is now live on eBay. The auction will conclude in seven days.Â Go to the eBay page directly, or find out more information here. Stefan Bucher is the captain of creative passion. You want to feel inspired about the potential of your own work? You want to feel guilty about being burnt out? Hang out with Stefan for a day. On this, our second episode, we did just that. Stefan was, surprisingly, in Nebraska for several days painting a monster mural for Concordia University, and they were gracious enough to spare a few minutes of his time for us; during which we recorded this show and shot video for the short film Stefan Bucher: Monster Maker, where he created the monster we are putting up for auction. Hope you enjoy the show and we’ll see you next week! 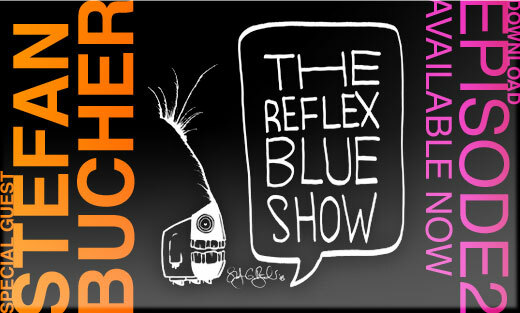 Click here to download The Reflex Blue Show with Nate Voss and Donovan Beery, Episode 2 (22 meg) or click here to subscribe directly from the iTunes Music Store. I had originally met Stefan the first weekend in October 2002, when he was judging the AIGA Nebraska design competition along with Steve Hartman and Sharon Werner. It was the first year I had entered more than one item into the competition, and the first time I would witness a design competition be judged, as I was helping move entries and doing some of the behind the scenes work. I got shut out. Nate, who designed the poster for the competition won a gold award. I have yet to be shut out since, but I realized how random some judging can be. You will almost always lose more than you win, so it seems pointless to hold it against anyone. I just found it odd that the first two guests we’ve had on the podcast are two of the judges from the same show, and I of course had to mention it to both of them. But neither were in the area to judge this time, they were here to present, and in Stefan’s case, also paint a mural (shown after the jump).